They often say that a dog is a man or in our case a girls best friend! Pets can provide an incredible connection for girls teach confidence, independence and responsibility. But sometimes the relationship between children and pets of all ages can become rocky, sometimes scary and dangerous. Lots of dogs are relinquished to animal shelters because their families don’t feel as if they can cope with parenting humans and dogs at the same time. Either it’s too chaotic or it feels unsafe. But with adequate support from professionals, they can set up strategies and a training plan to help families regain peace of mind and keep their families safe. We can teach children to read dog body language so that they can learn to interact safely with all dogs, not just their family pet, and prevent problems before they escalate and become dangerous. By learning to read dog body language and do basic training, girls can grow up to be confident with the family dog and other canines they may encounter in their lives. We can help to keep them safe, and they, in turn, can feel empowered by helping others learn the same life skills. Michelle Stern is a San Francisco Bay Area native and currently lives in Marin County. She’s a mom to a daughter heading to college next year, and a 16 year old son. She also shares her home with her husband, dog, service dog puppy and 4 mean chickens. After teaching high school biology and running a cooking school for children for 16 years combined, she has returned to her first true love. Dogs. Working with dogs also means working with their humans, which she adores. 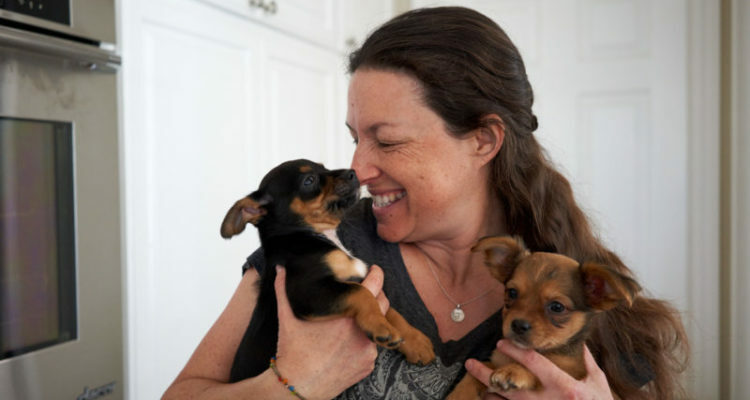 Michelle is a dog behavior consultant, a Licensed Educator for the Dogs & Storks®, and Dogs & Toddlers™ Family Paws programs and a dog training instructor for the Marin Humane Society. She is also a partner with The Family Dog, offering private in-home training lessons for whole families, kids included.